A very rare set of six French baroque, Regence C1720 walnut ladderback chairs, with turned front legs. Reglued, polished and reupholstered. The red broadcloth is period appropriate. 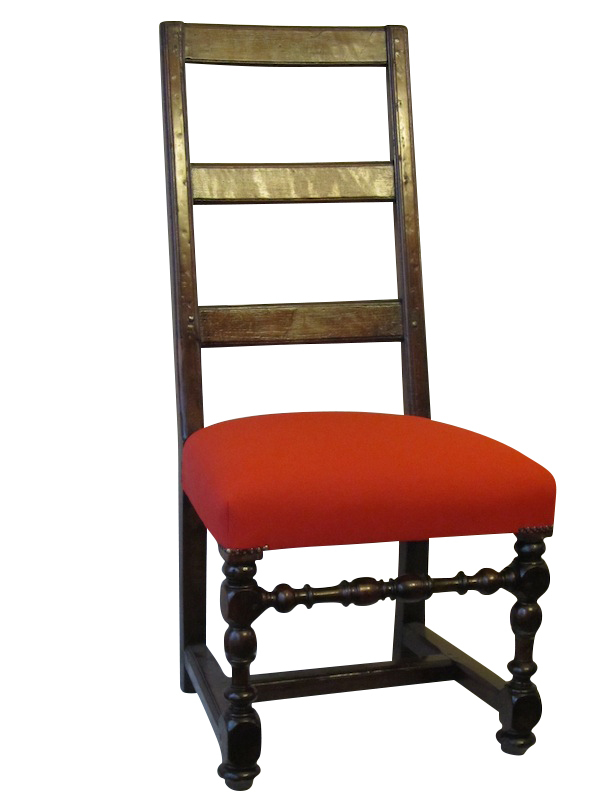 These tall and stately robust chairs are mortise, tenon and pegged, so they will last hundreds of years more. The rails of the ladderback and the stiles are decorated with a run moulding along the edges, and this is mirrored on the edges of the H stretchers that join the legs. The three horizontal ladder bars are concave for nestling the back in comfort. Although grandeur was the primary requirement of baroque period furniture, comfort was not sacrificed.